I usually rip with Max. It rips the CD to Apple Lossless and adds the files to my iTunes library, no problem. Lately I've been using XLD, since it seems to be more reliable. But it operates differently from Max in a way that confuses me. When I initiate a rip, it asks me to specify an output folder. I have to create a folder on my desktop for it to "dump" the files into, even though I have selected that XLD add files to my iTunes library, which it does. So I end up with two copies of each file: one in the proper folder in my iTunes media folder (as I have iTunes keep my library organized), and another in this temporary folder on my desktop I've had to create, which I then have to delete after each rip. Is there a way to avoid this doubling up? It seems that XLD doesn't have a built-in temporary folder to put files into before they get added to the iTunes library and copied into their appropriate place in the media folder. I have tried selecting "Use Temporary Folder" in XLD preferences, but it still behaves the same way, asking me to select an output folder, which I then have to trash once the files have been added to my iTunes library and duplicated into my media folder. Is this just how XLD works? I believe it is just how it works. I'm guessing most people rip with XLD to create archival copies rather than just have it send all files to the iTunes library. Thanks so much! I tried that, and after trial and error, it turns out that's ALMOST the solution. The fix was to do everything you said, but DO select "Add encoded files to iTunes if possible". Now it works like a charm! With the output directory set as the "Automatically add to iTunes" folder, and "Use temporary folder" selected, it no longer asks me for an output folder each time. And it successfully adds the files to my iTunes library and places it in the appropriate organized folder in my iTunes media folder. And as far as I can tell, that is the ONLY place that file resides (i.e. no duplicates). Thanks again for your help! Hope this is informative for folks out there. I am having the same doubling up issue. I add my tracks as output to Automatically Add to iTunes which moves the files to the correct subfolder in my library BUT when you look inside of iTunes the tracks appear doubled. 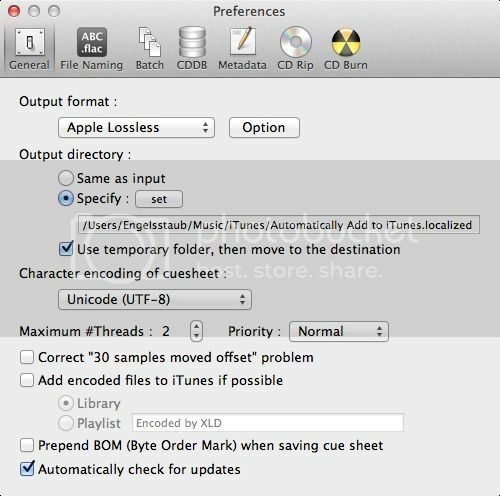 Are you suggesting the solution is to set output path to Automatically Add to iTunes, check yes to use temporary folder, and check yes to Add encoded files to iTunes? I am double checkling because I am wondering ho iTunes will move the files if we use a temporary folder inside of "Automatically Add to iTunes" instead of the actual folder?